PR Projector Lamp (White and Blue) Led headlight Lens projector with Angle eye For Bajaj Pulsar 180cc Dtsi 1 Pcs@1868 Rs [Mrp:-4998] - Onlinedeals.discount - A leading product discovery website. Find the true prices of products, read reviews and buy top brand products at reasonable prices. Compatible with bike, light range 200 Mtr. 6000K xenon white and 3500LM super bright. Check Seller Name as Blue Star Auto Stores for genuine PR branded products, else return the product. Geneuine products from Blue Star Auto Stores Ideal for night driving purposes and gives 10 times brighter light than normal headlight bulb. Power consumption of 15 w but more light than usual bulb. It has LED chip. Easily replaces your current halogen bulb , easy installation inside headlamp.LED White 35W 6000K 3500LM Motorcycle LED Headlight Bulb Motorbike Headlamp Motor Lighting Item: H6/H4 Motor LED Headlight Kit Power : 30W High, 20W Low Current: 2.2A(tested at DC12V) Lumen : 3500LM per set Color temperature: 6000K Chip:high intensity led Voltage : DC10V-24V LED Quantity : High Intensity LED Working temperature:-40Celsius -+70 Celsius Life span: +50000hours Material:1.6063 alloy light body with glass lens High Beam ,Low Beam , Super White light Bike Headlight, Bike Projector light,Projector light, Bike light, Bike led Head Light. 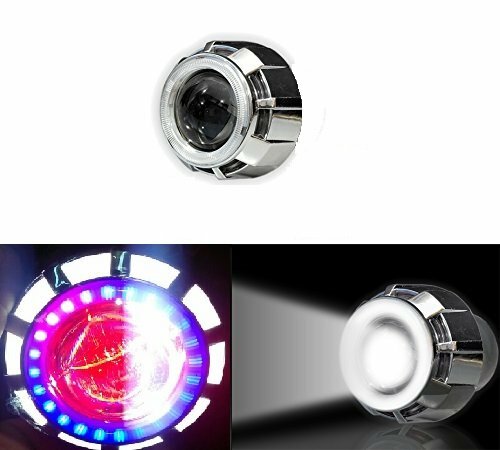 Projector light with dual angel eye ring.